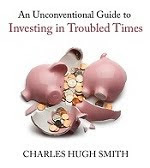 oftwominds-Charles Hugh Smith: What Options Are Left for Central Banks? Central banks have reached a fork in the road. Never before have quasi-omnipotent financial gods had so few powers. A lot is being written about central bank policies now as the Federal Reserve ends its primary quantitative easing (QE) program and the limitations of central bank easing become increasingly apparent in Europe and Japan. 1. Offer cheap credit to the banking sector, the idea being that the banks will use the free money to make loans to households and businesses. These new loans would inject the central banks' new money into the real economy. 2. Buy bonds to push interest rates down and buy mortgages to support the housing market. 3. Provide unlimited liquidity so banks and key financial institutions facing a liquidity crunch have a lender of last resort. The basic idea here is that central banks provide a buffer against financial crises. When short-term loans come due and the borrower has run out of cash, rather than slip into insolvency they can borrow short-term money from the central bank. The ability to push down interest rates is helpful as a buffer when credit-tightening and fear of defaults push interest rates up enough to choke off normal lending. What happened over the past six years is that central banks have moved from providing short-term buffers to being the saviors of the government, economy and asset markets. This is an extraordinary transformation, and it's the core reason why central bank policies are now failing to move the needle: they were designed to serve as short-term buffers during crisis and the resulting recession, not permanent props under government borrowing, the financial sector and the stock, bond and real estate markets. Every conventional analyst expected the global economy to recover quickly after the central banks provided the usual buffer. But they were wrong; the structural problems stemming from financialization--excessive debt, leverage, risk and opacity--coupled with near-zero oversight and perverse incentives have wreaked havoc on economies around the world. On Monday, I suggested central banks would resort to buying stocks to prop up the stock market: Will the Fed Let the Stock Market Crash Before an Election? Reports suggest central banks and states are already buyers of equities, either via proxies or via public pension funds that have increased their ownership of equities. Central banks have reached a fork in the road. The policies have the past six years-- jawboning, i.e. talking up the power of the central banks, buying bonds and shoving new money into the financial sector--have reached diminishing returns. The public's once unbounded faith in the efficacy and power of these policies is waning, and now central banks face open skepticism. One path is to admit the limits of central bank powers. This is tough to do when you've been glorified for so long, but the honest confession of the limits of making short-term buffers into permanent policies would force governments to deal with the issues that have been avoided for the entire six years of central bank free money. The second path is to start buying assets en masse. With jawboning and easing both discredited, there really is nothing else the central banks can do to support asset prices and keep the thin veneer of a healthy economy from peeling off. The third choice--continue jawboning and launching yet another failed easing program--will only further discredit central banks and their policies. Thank you, Robert C. ($35), for your splendidly generous contribution to this site-- I am greatly honored by your support and readership.